eTwist is an online retailer that sells something for everyone, from toys to watches, home goods and appliances and much more. It isn’t a website I had come across before but after taking a look around, I noticed that there were a lot of recognisable, branded products at very competitive prices, definitely worth a look at before making a purchase. We were given the chance to try out some Ravensburger puzzles on their website to keep the kids occupied over the holidays. Being familiar with the Ravensburger brand, I could see the prices were really good for these items, and we chose something the kids have longed for, a 3D puzzle. I found one of Big Ben with the Minions on, something I knew that would have the utmost appeal and I can safely say it didn’t disappoint! 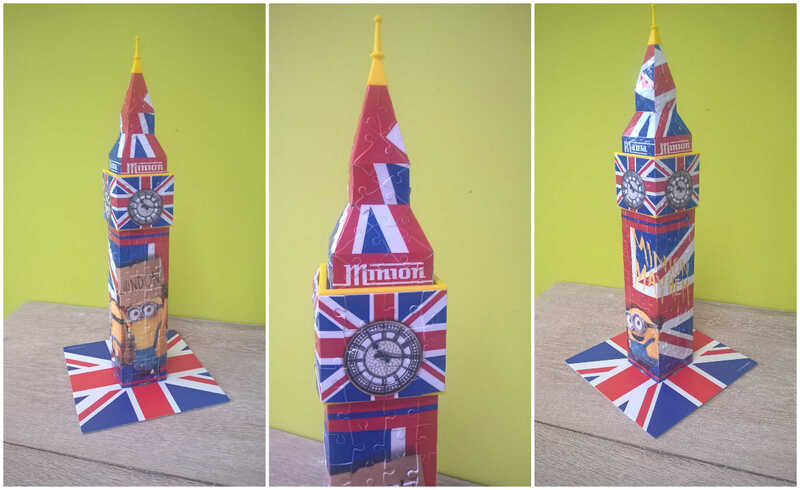 Both children were super excited upon seeing the Ravensburger 3D Minions Big Ben, and standing at 41cm tall this is a fantastic looking puzzle that doubles up as model on a shelf. With 216 pieces this was a great puzzle for 8yr old Miss M and just the challenge she needed. The pieces for this are unlike a traditional puzzle, and are numbered on the back to help you construct the pieces in the correct order. We all helped looked for the right numbered pieces but Miss M was chief builder. 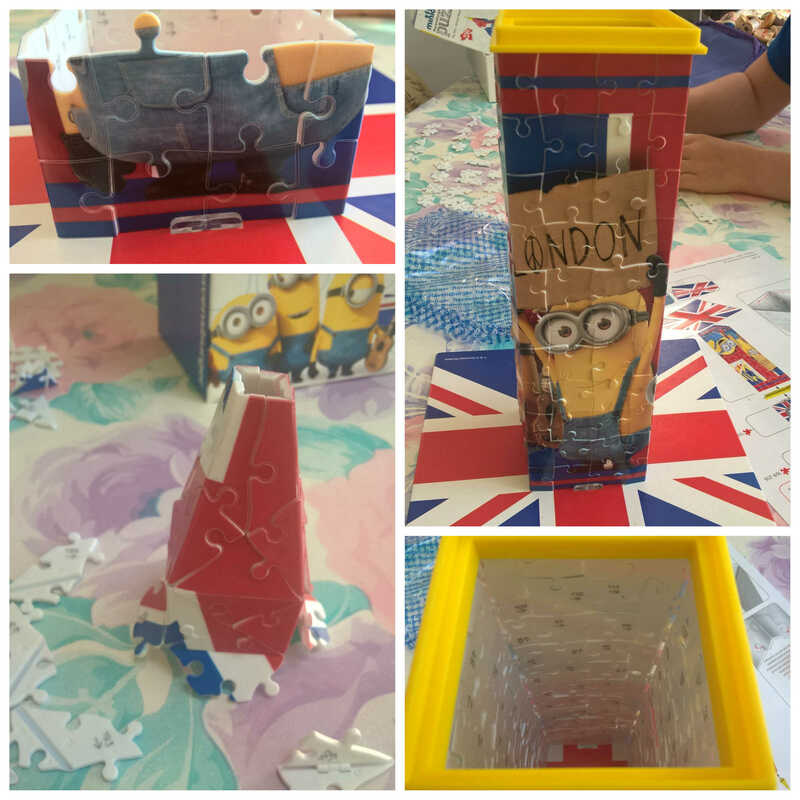 We soon saw progress with the puzzle as it rose from the ground, into the shape of Big Ben, and the minion aspect kept 5yr old Mister B amused. He made his mission to put the finishing yellow piece of the tower on the top! This puzzle is of excellent quality with plastic pieces, many of which are hinged for the corners and angles. These work really well to create the added dimension to the puzzle and in fact a puzzle that has been exceptionally well received by not only my own family but by others that have seen it! Our second puzzle to complete was this Crazy Cats at the Perfume Shop which I just adored. It is a 500 piece puzzle ideal for families to complete together. We love cats and 5yr old Mister B was my chief corner and edge finder! We have all had great fun completing this puzzle right down from the children up to the grandparents putting in a few pieces when they pop round. 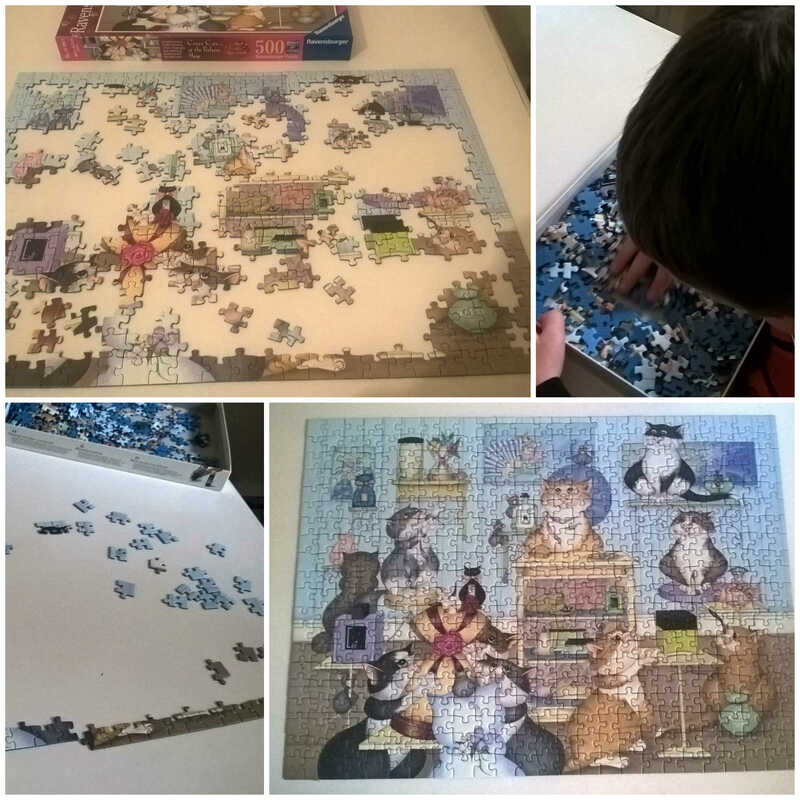 We spent a few days doing this but loved looking for pieces for each of the cats and the children were eager to be the ones putting in the last few pieces. 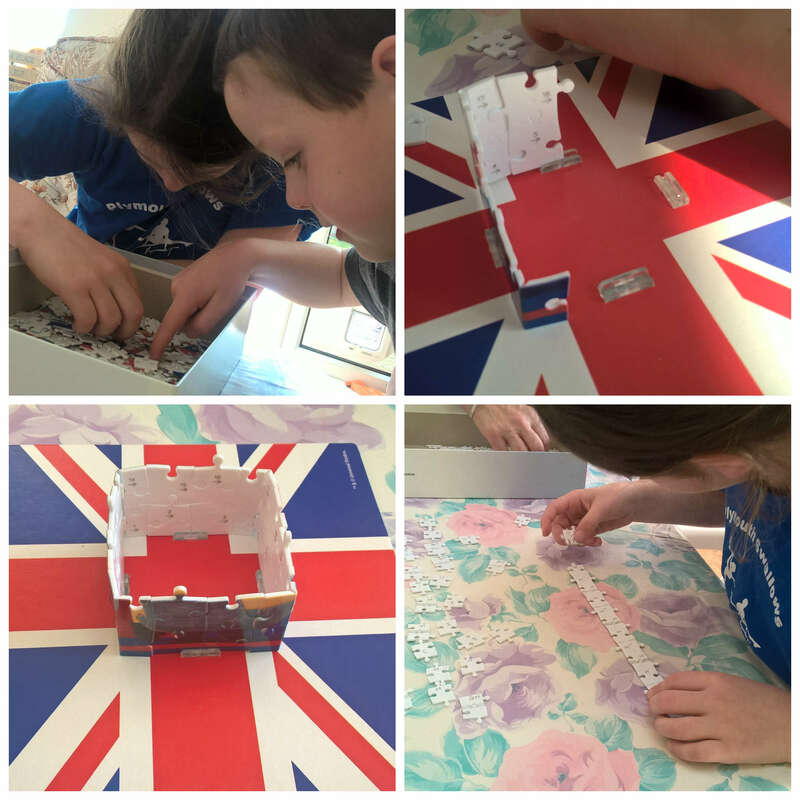 Puzzles are much loved in this house and are something everyone can join in with. They are a great activity for rainy days and school holidays. Why not check out what eTwist has to offer to keep the kids occupied over the next couple of weeks, puzzles are just one of the things on their site as well as much, much more! The Shed Inc is a homeware website selling a wonderful array of items for around the home, featuring gorgeous high quality fabrics and unique designs. 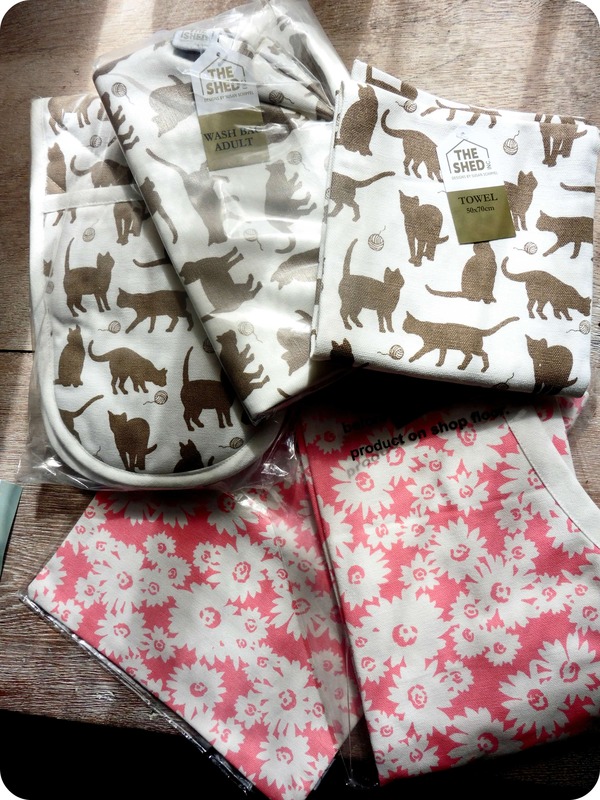 We received a selection to try out in the Moggy and Pink Daisy designs. Being a cat lover the Moggy design products immediately appealed to me. In a very neutral taupe and off white colour they will suit any kitchen or room. The first thing I noticed about The Shed Inc’s products is the quality. Immediately you can see these are well made using strong, durable fabrics that feel thick and being 100% cotton are machine washable. The tea towel is really thick and absorbent and looks lovely hanging over my kitchen radiator. The oven gloves are equally thick with great padding to ensure your fingers don’t get burnt when using the oven. They are well made with thick, well stitched binding that will last. 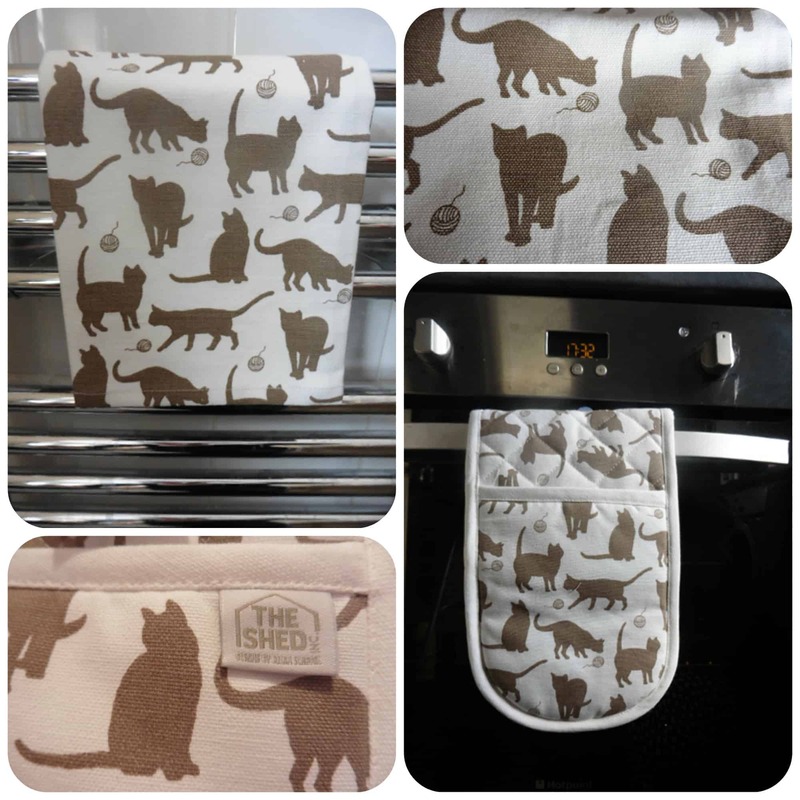 I also love the cute Moggy design and they look great in the kitchen. I also tried this large wash bag which is tall, perfect for items such as deodorant, hairspray etc. 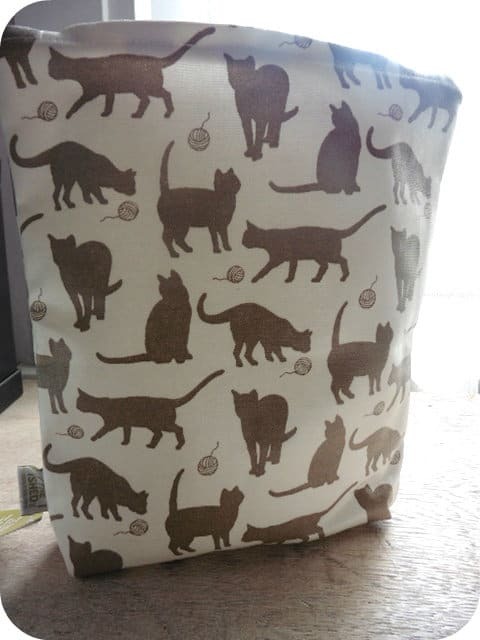 It comes in the same Moggy design but has is a wipeable coated fabric, perfect for sitting in steamy areas. 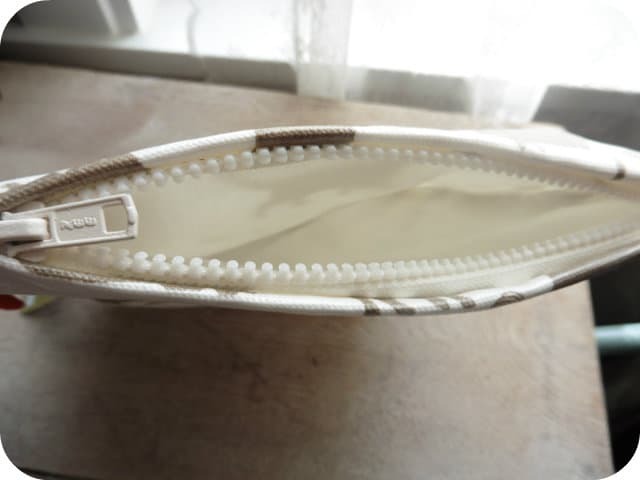 The inside is cotton, but ideal for dry items as mentioned above. There is also a really sturdy, heavy duty zip across the top, which is brilliant although I did find the opening slightly on the narrow side, it felt like it needed to be a little bit wider. I just love the Pink Daisy items we received for Miss M and her eyes lit up when she saw them which is a good sign. The cotton tote bag is a nice size and can have many uses but perfect for Miss M to put her book and a couple of Barbie dolls in when she goes out. 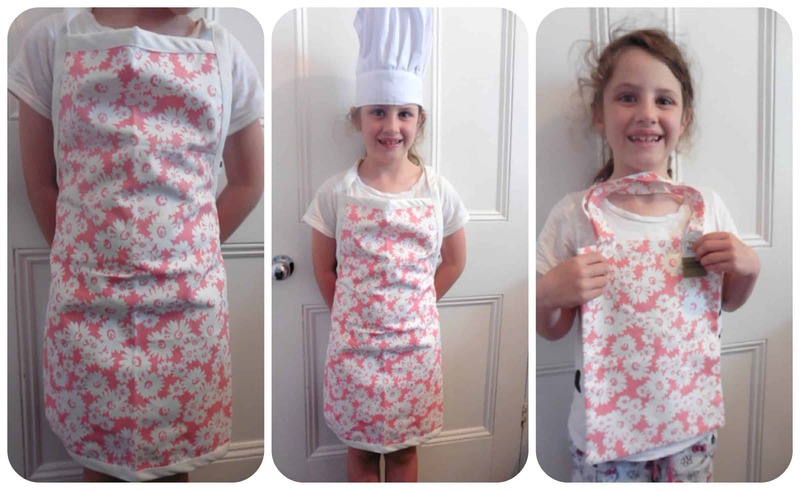 The apron was an immediate hit too and before I knew it she had it on along with her chef’s hat ready to bake!! Again with these products they are made with incredibly thick, durable cotton and finished beautifully with thorough stitching. 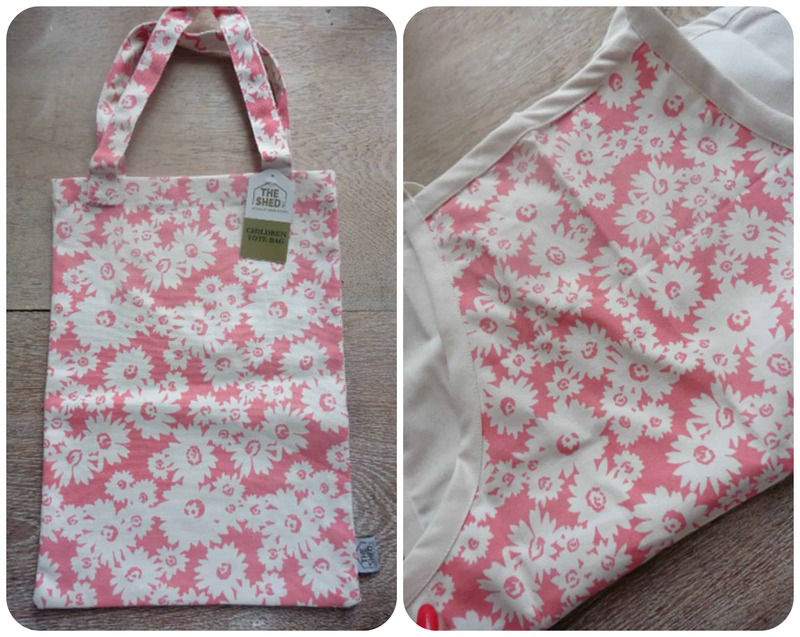 The apron has a lovely thick binding around the edge which adds to the look and design as well. I love all the products we have tried from The Shed Inc and feel that they are all made to an excellent standard. Not only are would they be a lovely treat to buy for yourself, but they are perfect for gifts. With other prints and products available, why not take a look at The Shed Inc and you may just find yourself wanting to treat yourself to one of their lovely products.